In the UK, harmful nitrogen dioxide air pollution has broken legal levels every year since 2010, and our toxic air has been described as a public health emergency. The UN itself has said the air in more than 40 UK cities and towns is too dangerous to breathe. 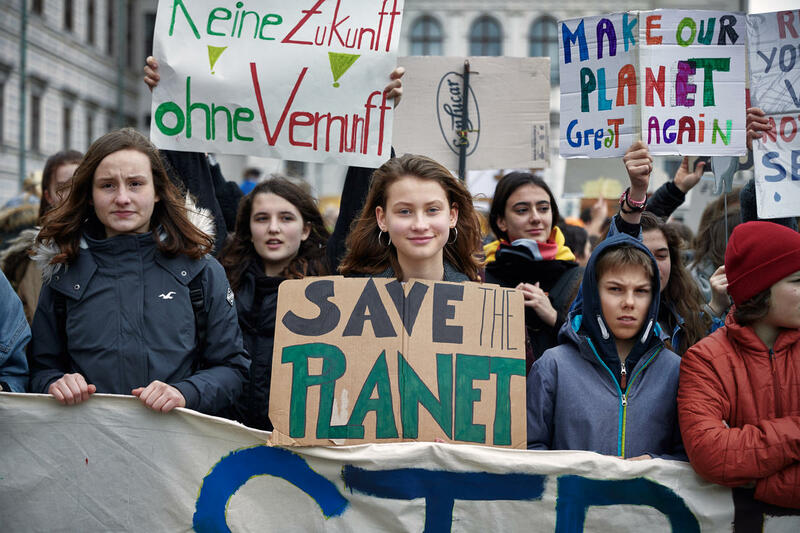 It’s against the backdrop of this crisis, that a group of us at Greenpeace crashed the car industry’s annual Christmas gala in November 2017 and publicly presented VW – one of the largest car companies in the world – with the Greenpeace Toxic Air Award. NOx (nitrogen dioxide) is a harmful air pollutant that’s known to cause respiratory conditions. Diesel causes 90% of the NOx emissions on UK roads. And the VW Group produce more diesel cars than any other company – by far. 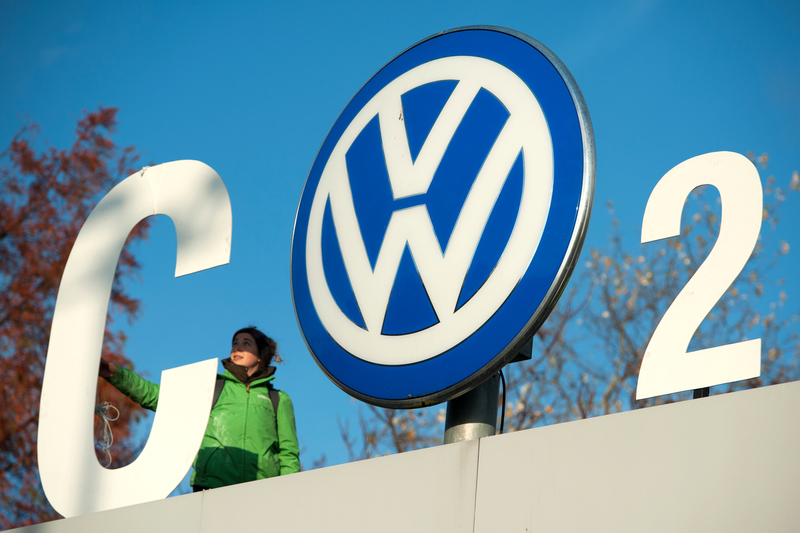 Two years ago, VW were found to have cheated diesel emissions tests in the US and Europe. They put software in their cars that meant the car would recognise when a test was taking place, and only then turn on the full toxic emissions filter systems. As a result of this cheating, VW spewed nearly 1 million tonnes of extra pollution into the air. An MIT study shows that VW’s excess emissions from Dieselgate will lead to 1,200 premature deaths across Europe. VW have more lobbyists in Brussels than any other car company. And while people in the UK have been breathing in toxic air, VW’s lobbyists have been working hard to weaken European emissions standards. VW are a political force – and right now they’re using their power to keep our air dangerously polluted. The evidence for the health damage caused by diesel is mounting week on week. Doctors say it causes asthma in otherwise healthy children, stunts children’s lung growth permanently and causes strokes, heart disease and diabetes in older people. But still VW’s CEO says diesel has a “great future” on our roads. If all this doesn’t warrant winning the Greenpeace Toxic Air Award, what does? 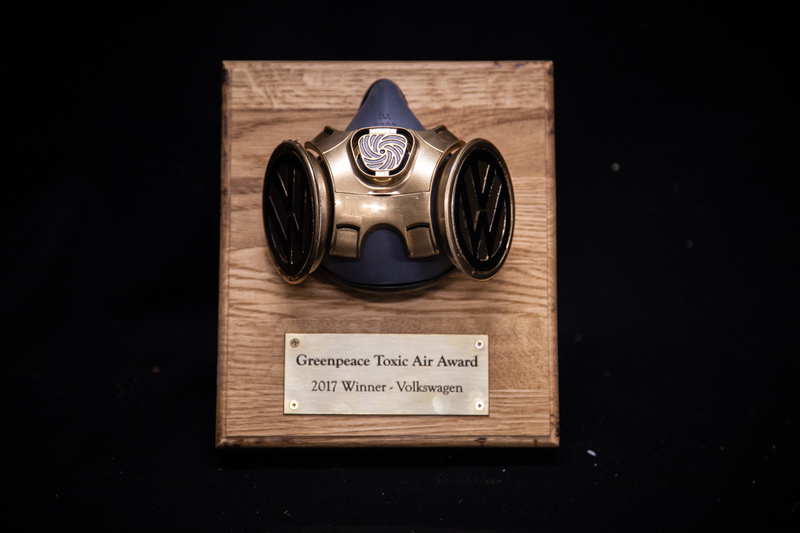 Since handing them their award, VW have gone back to work as usual – producing more toxic diesel cars that will spew yet more dangerous pollution onto our roads. They don’t need to do this – they have more than enough money to ditch diesel and to move to electric. And that’s exactly what our campaign is calling on them to do. We know we won’t win over-night. VW are one of the biggest car companies in the world and they’ve shown they’re prepared to fight dirty to keep this toxic technology on our roads. But Greenpeace is a movement of hundreds of thousands of people – and we’ve shown time and again that when we get the bit between our teeth we can force the very biggest corporations to do things they don’t want to do (hi Shell!). Last month, we stopped thousands of VW diesel cars entering the UK. This week, we embarrassed VW in front of their colleagues and the general public. But this is just the start. There’s much more to come…so stay tuned and get plugged in.